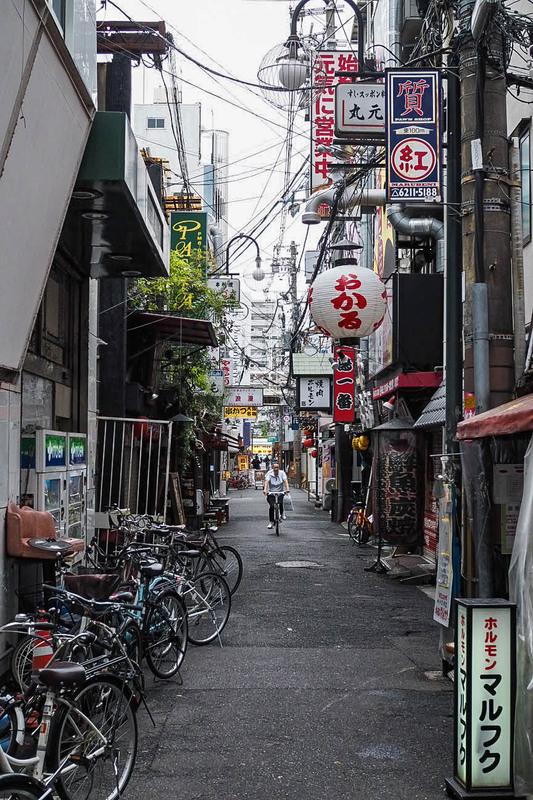 Before heading to Japan, I was told by everyone who’d been before me that Osaka was their least favourite city, but within moments of being there myself, I knew I’d disagree with them all. 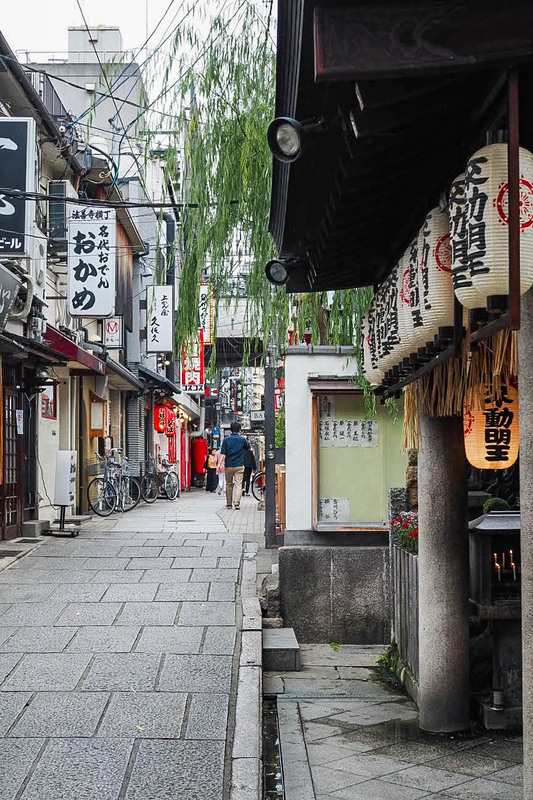 OK, it’s not the huge bustling, modern metropolis that Tokyo is, or has the history of Kyoto, but it is vibrant, friendly, and it’s wonderfully easy to lose yourself in its warren-like streets. 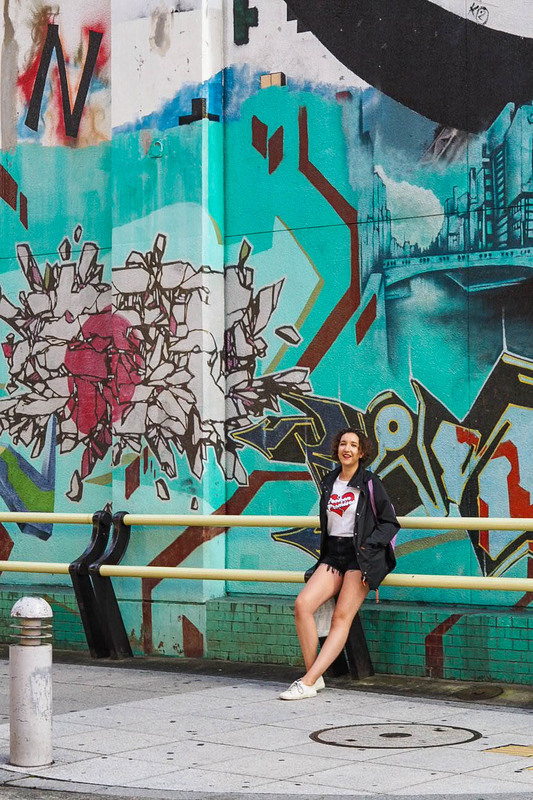 Being the gateway to so many other tourist cities via bullet train, including Himeji and Kobe, I didn’t spend as much time there as I would’ve liked, but I did have one full day in Osaka where I packed in everything I wanted to cover off, mainly in the Minami (south) area. 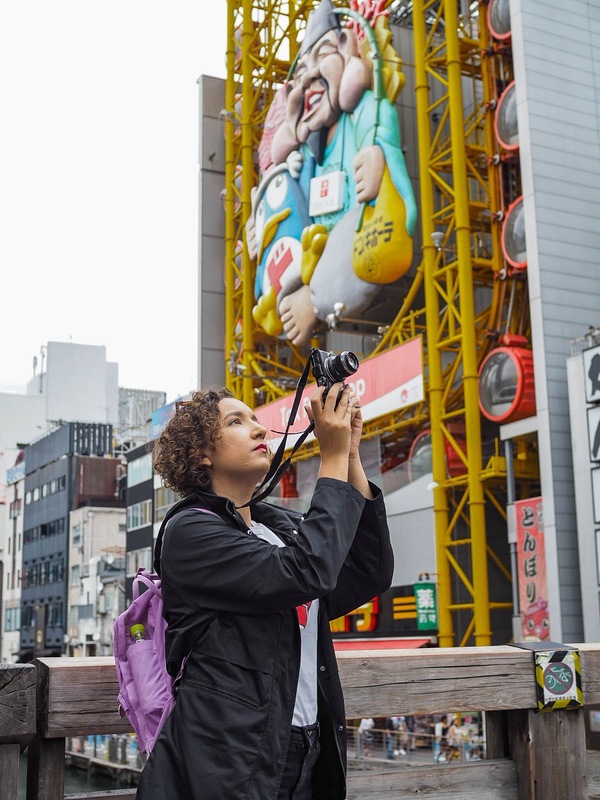 I stayed at the Ibis Styles hotel* right by Dotonbori, which serves up an awesome buffet breakfast with a stellar view to boot, so once you’ve loaded up for the morning, head out across the canal to Hozenji, a maze of streets that show the true heart of Osaka. Restaurants open for business, a mass of bicycles at every single turn. 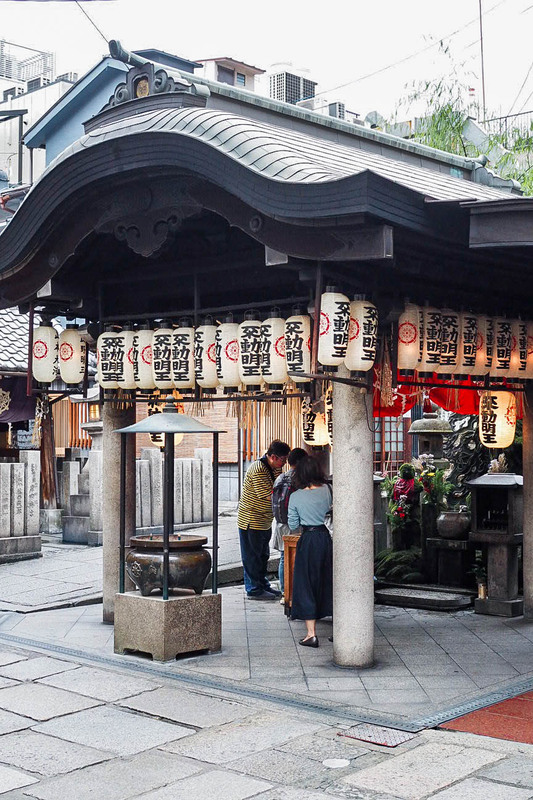 It’s quieter away from the hustle and bustle of the main strip, and a beautiful little corner of calm is Hozen-ji temple. 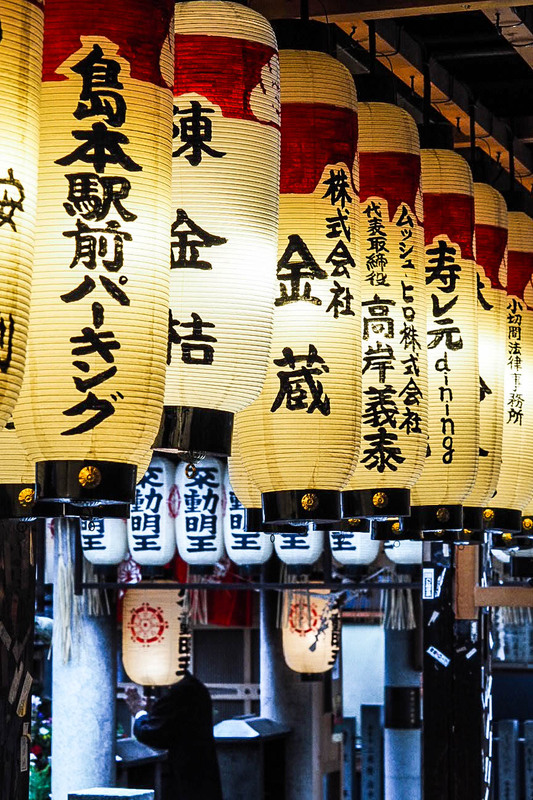 Buddhists come here to throw water over the shrine, meaning it’s covered in moss and greenery, with paper lanterns swinging in the breeze. A slice of serenity before heading back into the thick of it. 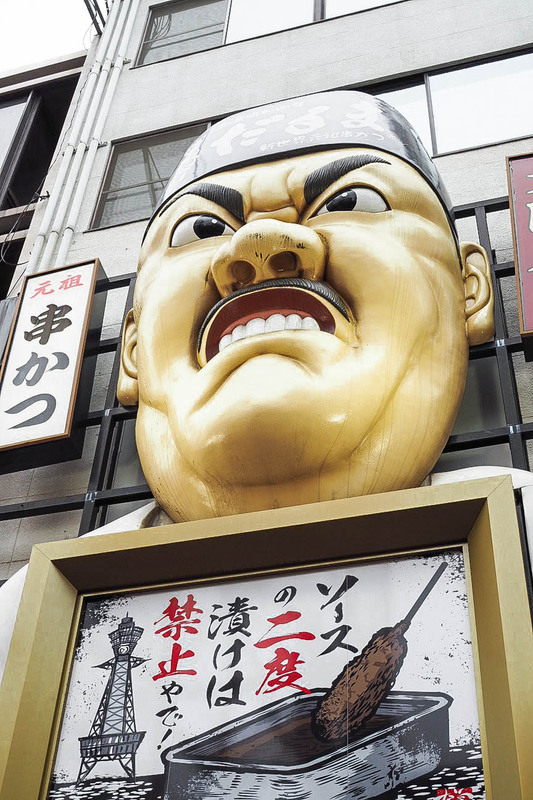 The most famous street in Osaka, and one of the most well-known foodie experiences in Japan, Dotonbori Street is 600 metres long and is flanked on both sides by row-after-row of restaurants selling a huge array of Japanese dishes. 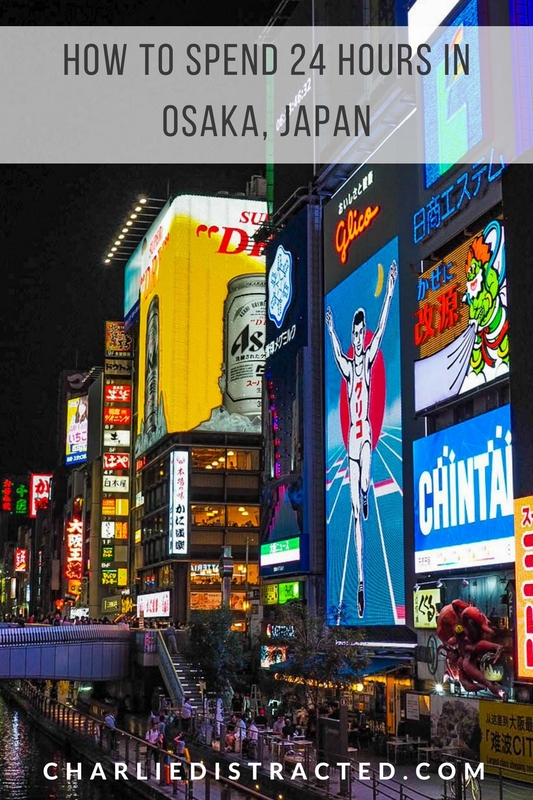 Start at the west end of the Dotonbori-gawa canal to stand in the middle of Ebisu-bashi bridge and get the best view to see all the insane neon lights and signs, including the ridiculous penguin ferris wheel ride that I wouldn’t be caught dead on. 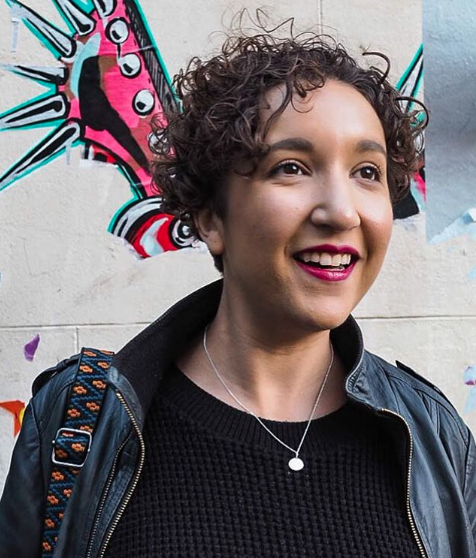 Obviously, you should absolutely have lunch here. 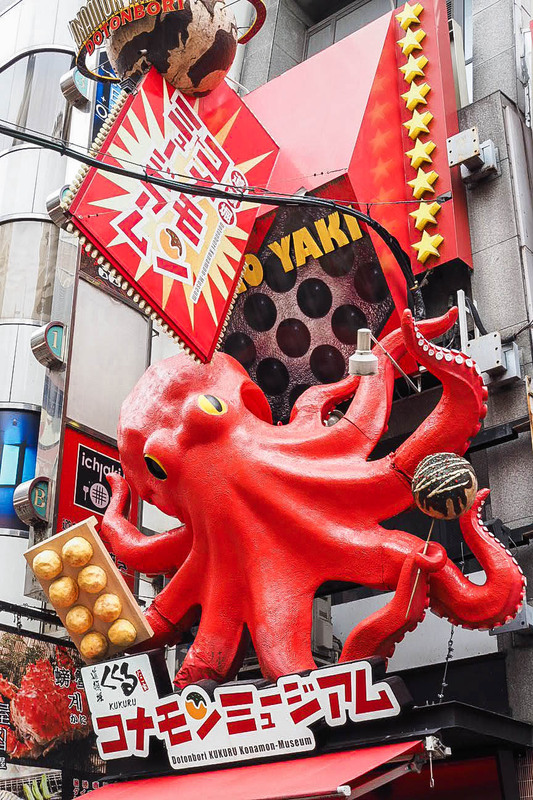 I sought out takoyaki, as a famous food of Osaka, and although it’s available in numerous places, I went for Kukuru, or as you might find it, the place with the giant terrifying red octopus on the front. 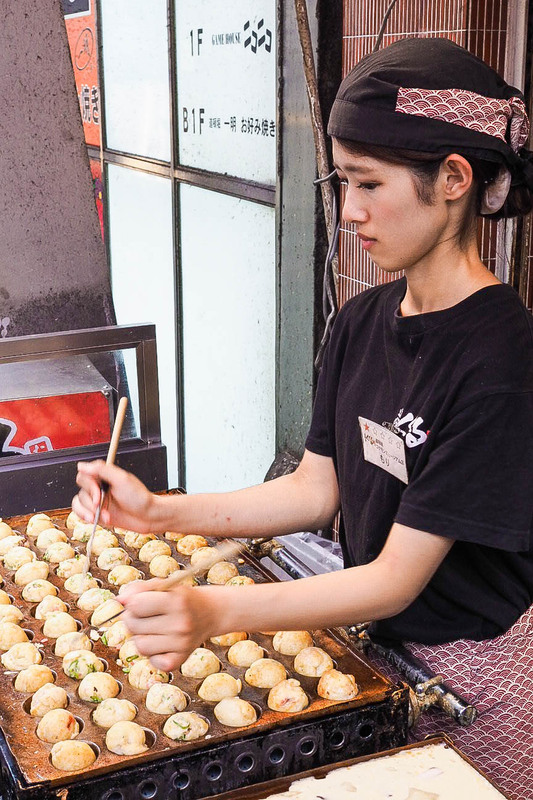 I was mesmerised by woman working there who were using long chopsticks to flick a wheat-based batter filled with octopus into perfect spheres which were then lifted out of the pan and topped with spring onion and bonito flakes. 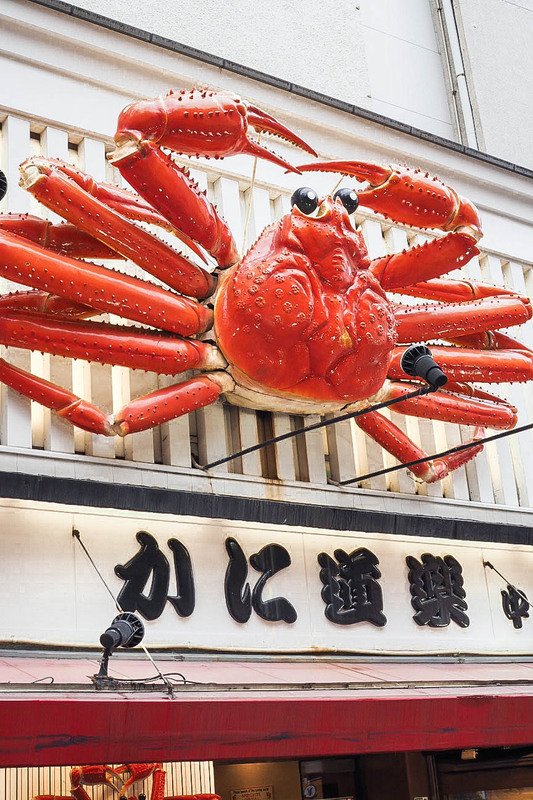 From there you can tick off all the crazy facades and signs, including the big red crab and the real angry man (they potentially have legitimate names, but you’ll know them when you see them!). 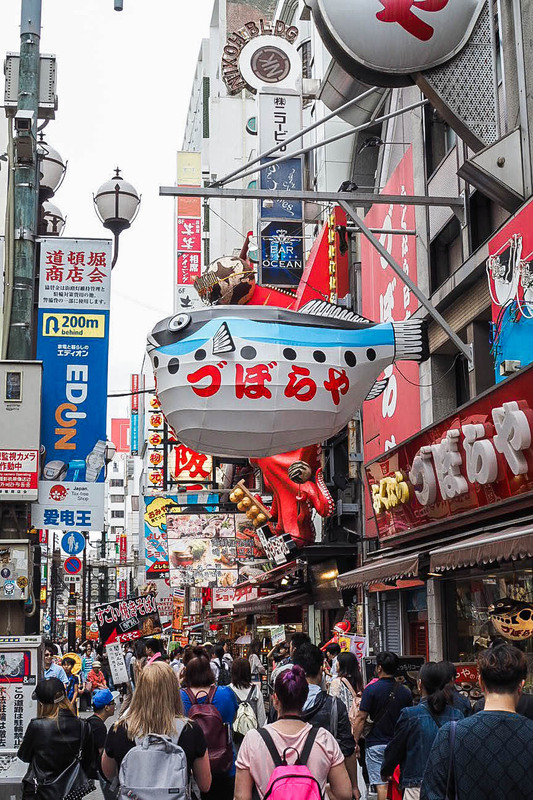 Going south from Dotonbori, follow the crowds as they funnel into Shinsaibashi-suji shopping arcade. 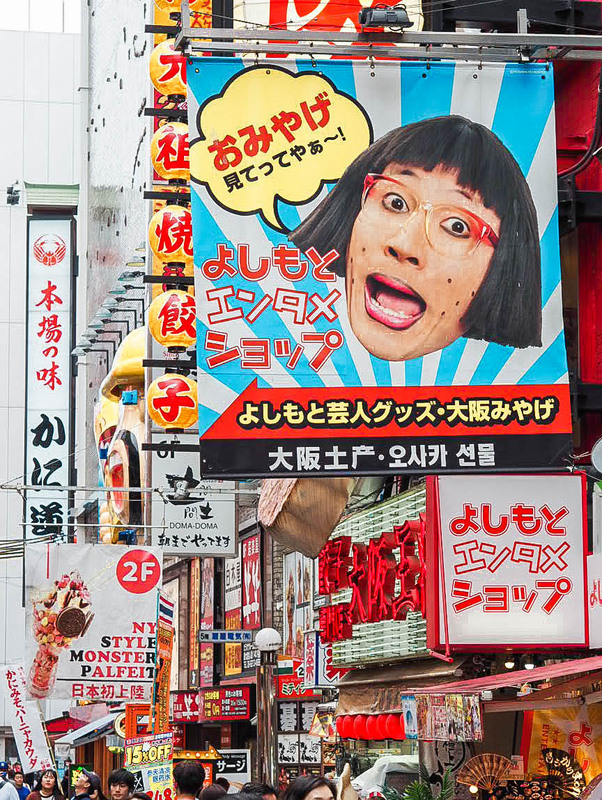 Even if you’re not in the market for any new purchases, the vast array of stores is still fun to walk around. 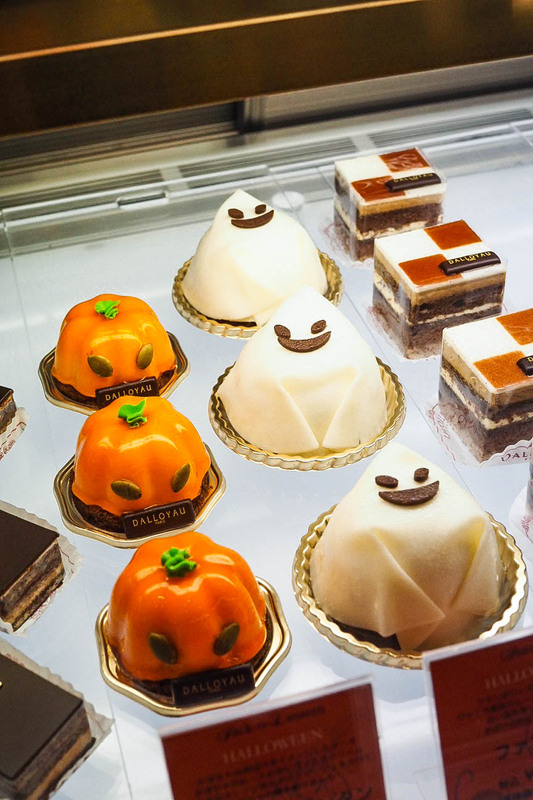 There’s a three-floor Sanrio store, patisseries full of adorable kawaii-style cakes, and a cosmetics store that Katy and I were lost in for a good 30 minutes. 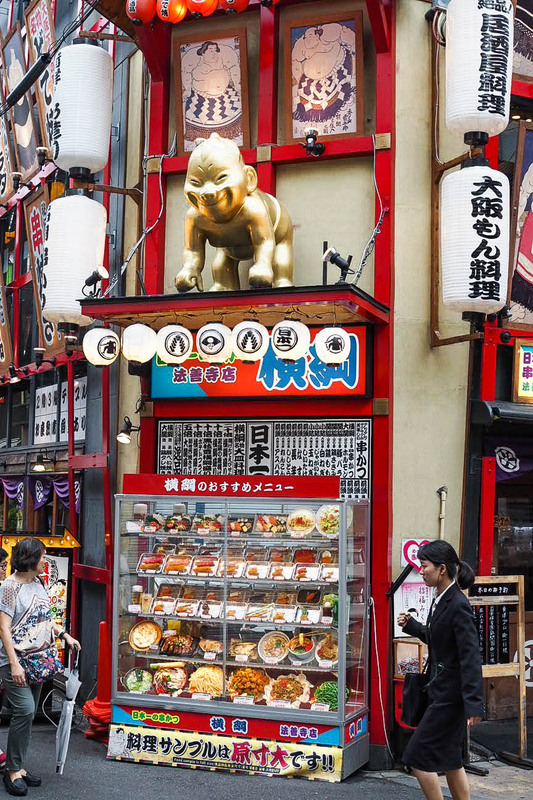 There’s legends across the internet about McDonald’s in Japan, so if this is something you want to try, there’s one here too. 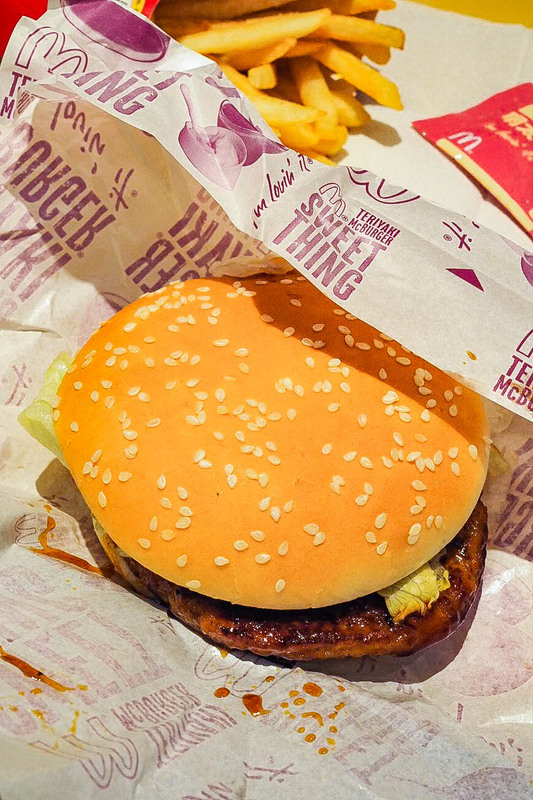 The Teriyaki McBurger was great, the Chelsea candy McShake is NOT. 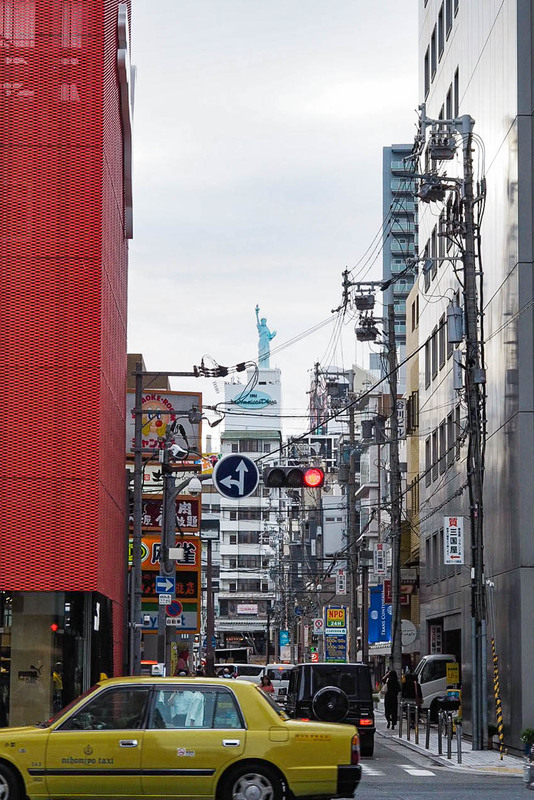 Welcome to Osaka’s hipster quarter, signalled by a miniature Statue of Liberty as you get closer. 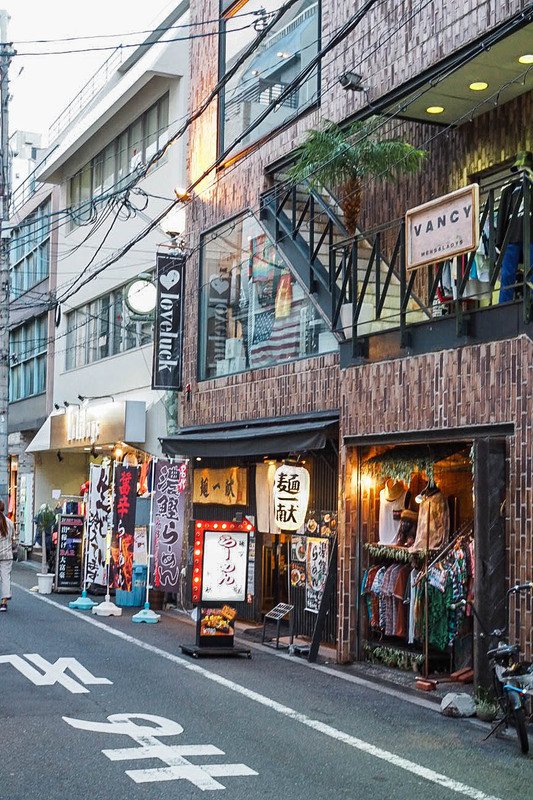 With a smell of incense reminiscent of Camden Market and a coffee shop culture like Shoreditch, there is just a slight western haze on an otherwise very Japanese area. 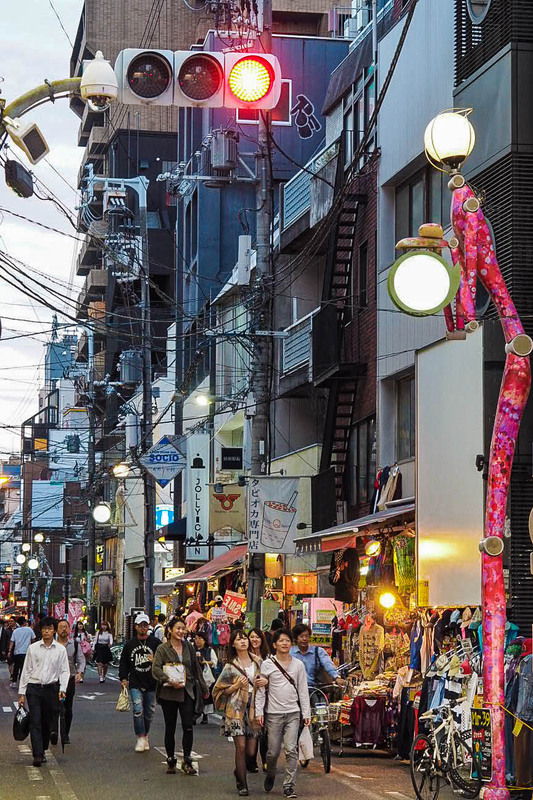 I could’ve spent days furrowing around the vintage and second-hand clothing stores, as well as some of the amazing niche fashion stores. 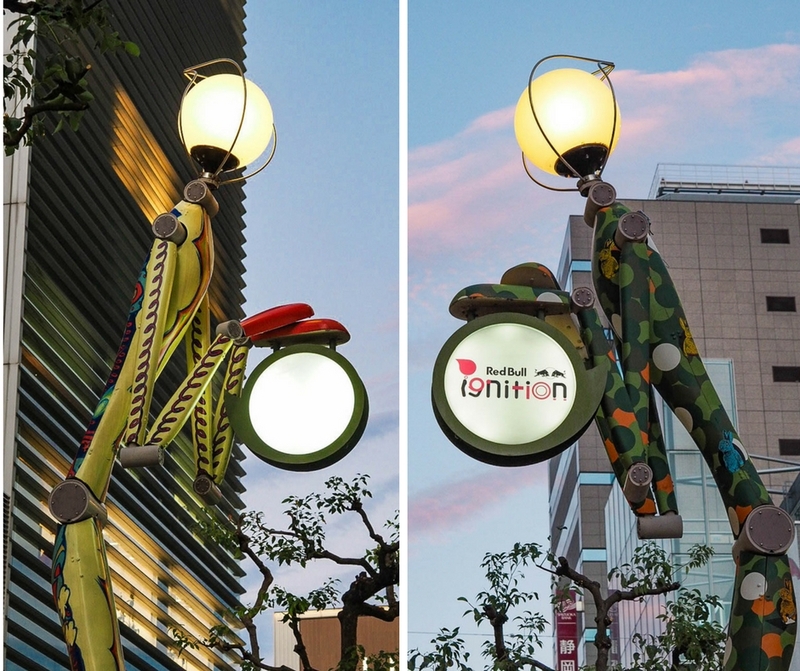 It’s the only area in the entirety of Japan that I spotted street art, with the Peace on Earth mural, but an artistic presence was felt throughout with the awesome stick-figure street lights that are on every street, and come to life when they light up as the sun goes down. 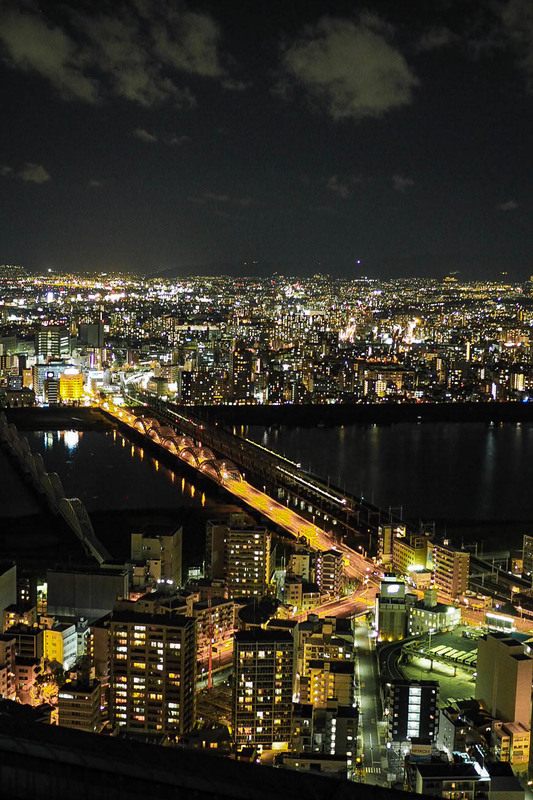 Hop on the subway and head into Osaka’s commercial centre, to get the best view of the city. 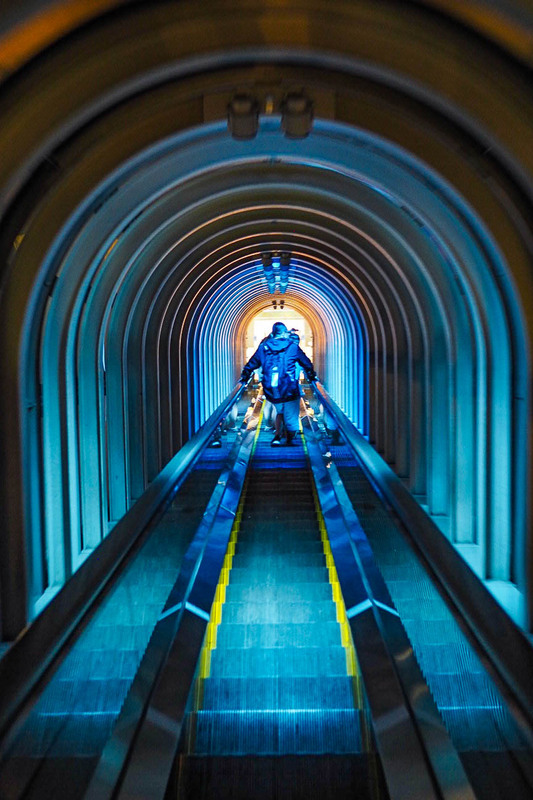 Before even heading up the Umeda Sky Building, just standing underneath it is impressive. 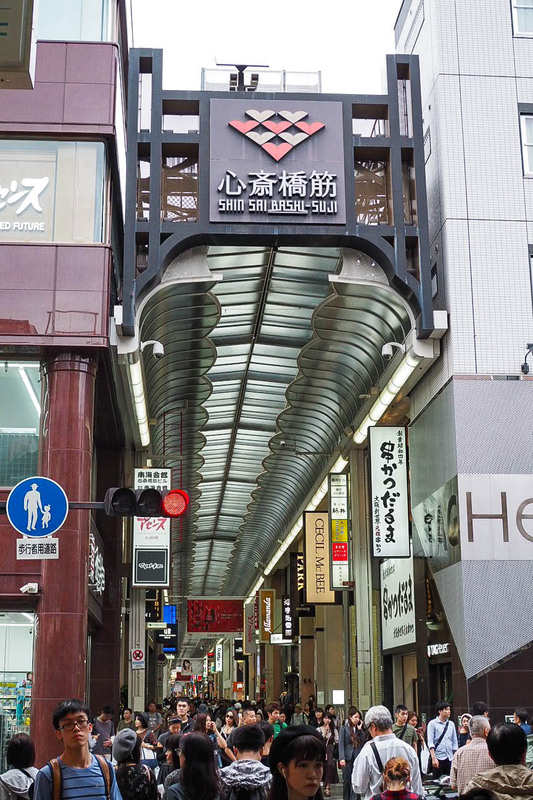 The structure is two towers joined together at the top by seemingly gravity-defying escalators. Travelling on them with nothing beneath you is not one for vertigo-sufferers, but it does get you up to the 360 degree observation deck. 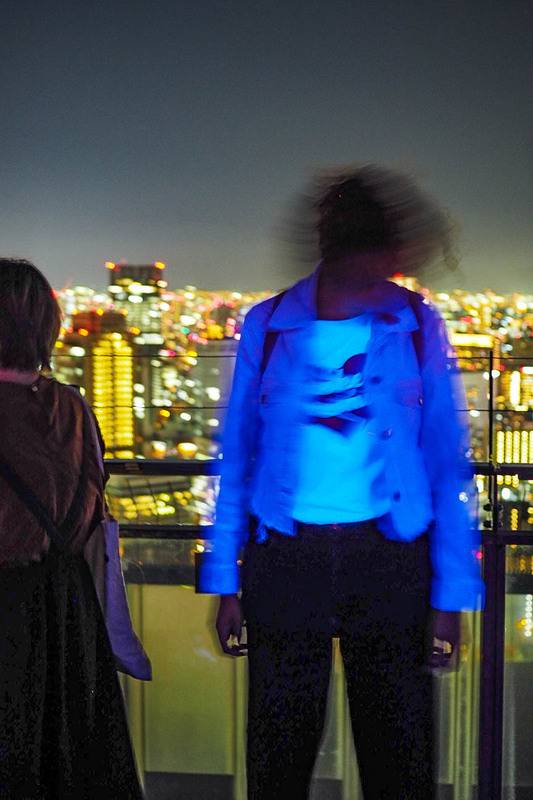 UV lights are everywhere meaning light pollution is kept to a minimum and you can see the thousands of twinkling lights from buildings and cars below, but means wearing a white t-shirt isn’t totally advisable! 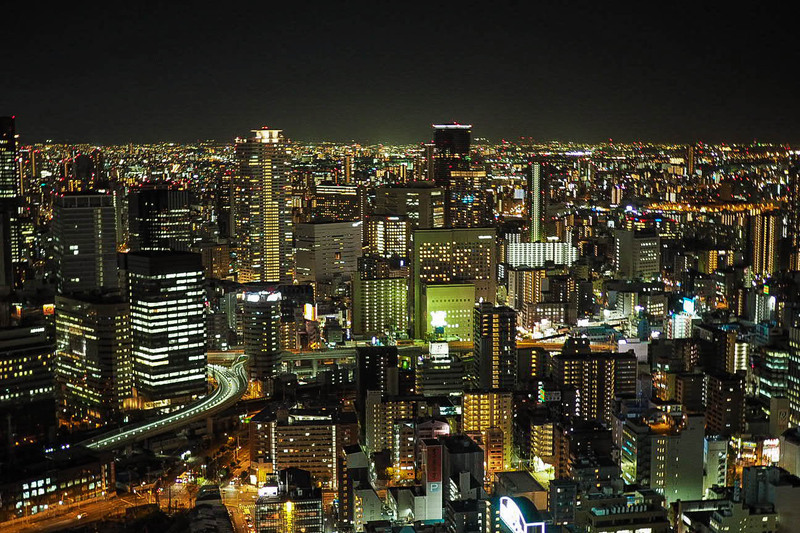 You can walk around the edge of the building, taking in Osaka from every angle, before heading back down the terrifying escalators. 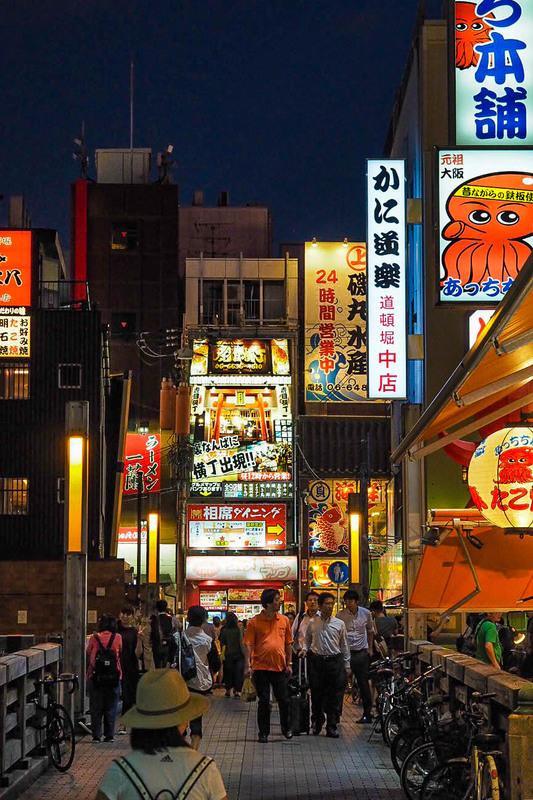 Finally, the best thing you can do in Osaka on an evening is just keep eating. 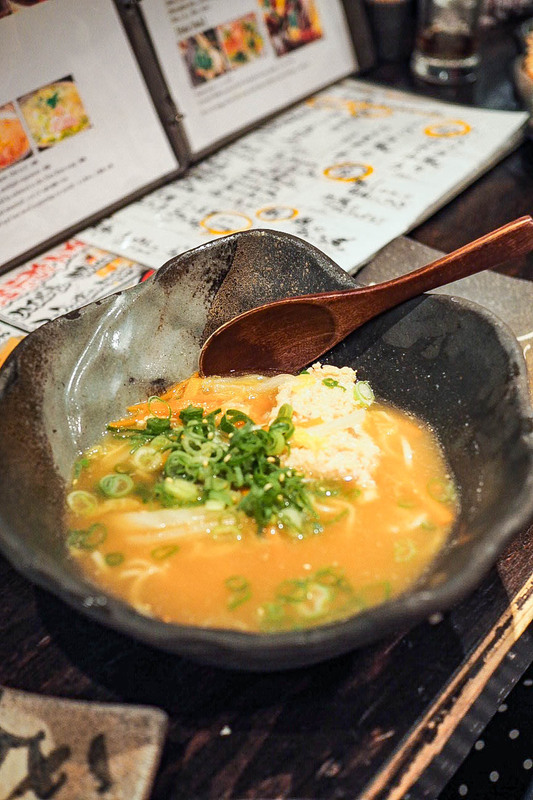 We ducked into the first ramen place we stumbled upon, and slurped on a deep broth with a spicy kick, drank tiny servings of beer (don’t expect to find a proper pint in many places in Japan), and attempted not-very-well-received jokes with the proprietors. 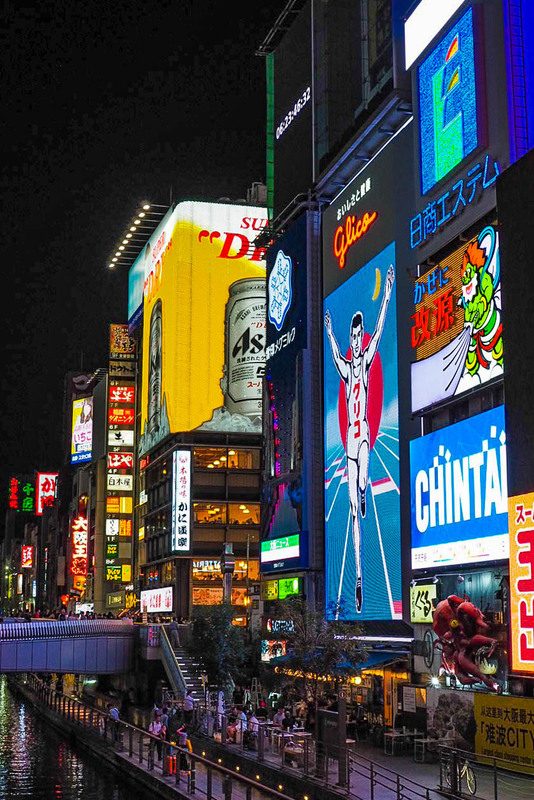 Walking through Dotonbori at night is a transformation to daytime, with the entire area assaulting all your sense with searing bright neon lights, including the infamous Running Man sign. 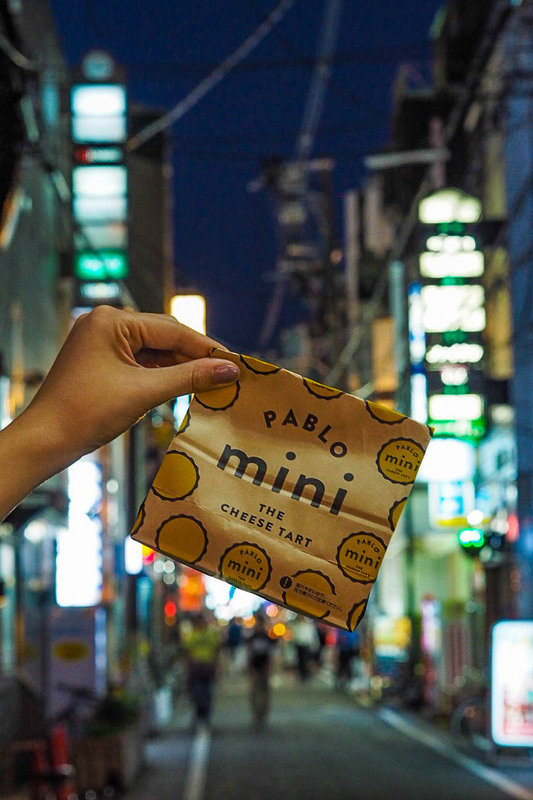 We dropped into Pablo for a freshly baked cheese tart which quickly became my new sweet obsession. Soft cream cheese in a shortcrust pastry case that falls apart in one bite (if you can stop yourself from eating it in one go, that is). 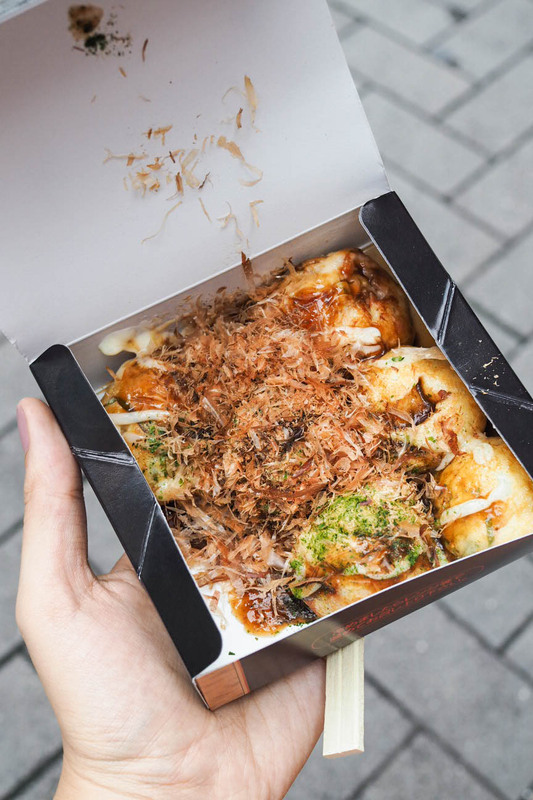 It’s the perfect way to wrap up a delicious and tiring day. 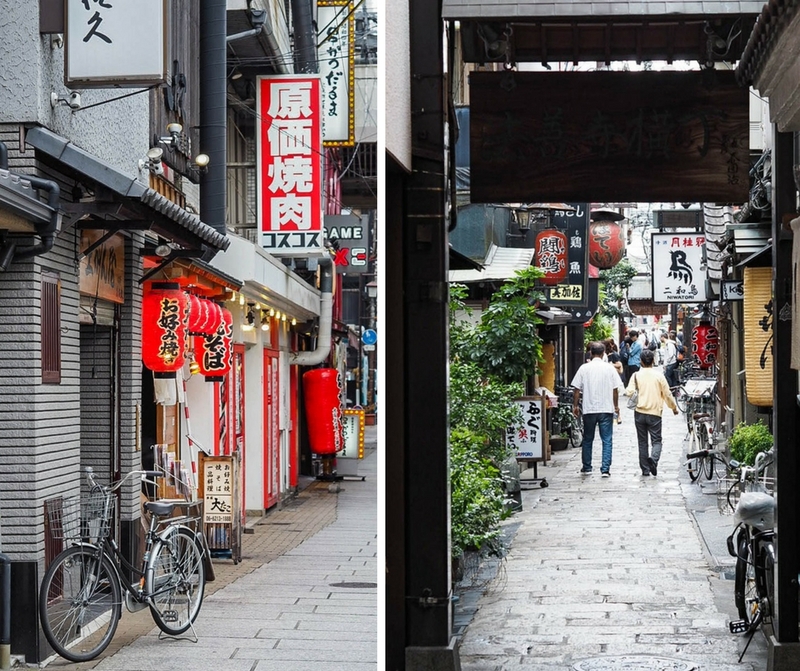 Osaka exceeded all of my expectations; but then, they were pretty low to begin with. 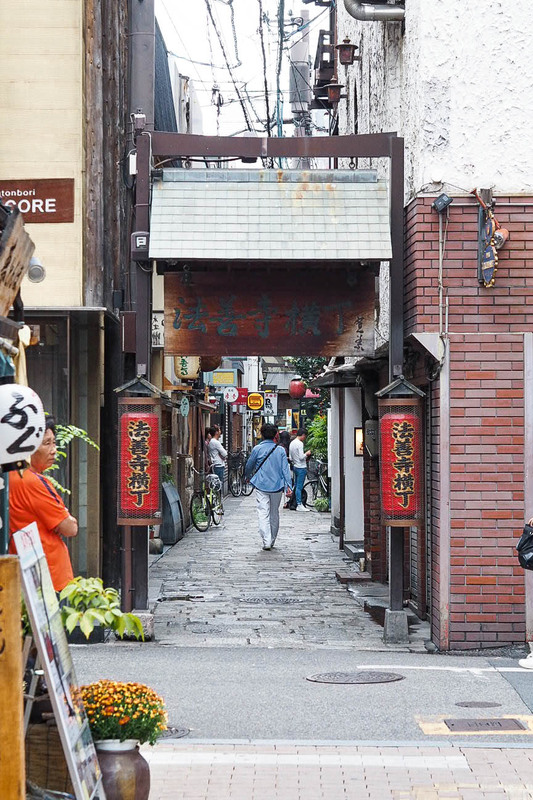 Do not underestimate this city when planning your Japanese itinerary – it has grit and guts, and I adored it.